There are at present two species of fox inhabiting Palestine: the Canis flavescens, found in the north, and the C. niloticus, common in the central and southern regions. But most of the passages of the Old Testament in which "shu'al" occurs seem to apply rather to the jackal (Canis aureus), the commonest beast of prey in Palestine. On the other hand, there are two special names for the jackal in the Old Testament, both of which are found only in the plural, "iyyim" and "tannim" (Isa. xiii. 22, xxxiv. 13 et seq., xxxv. 7; Jer. ix. 10, x. 22, xlix. 33, etc.). It may be that "shu'al" in the Old Testament is intended as a general term for the whole family or for several species of the Canidæ, while "iyyim" and "tannim" denote the jackal specifically as the "howler" (comp. the Arabic "wawi," or "ibn awa") and as the animal with the outstretched body. According to Tristram, even at the present day the two animals are commonly confounded in Syria, though the inhabitants are aware of their distinction. Thus the catching of 300 shu'alim in the story of Samson (Judges xv. 4) seems to refer to jackals rather than to foxes, since the former are gregarious and remain in droves, while the latter prowl singly and are taken alive with difficulty. So also in Ps. lxiii. 11, the word probably applies to the jackal, as it is characteristic of the latter, but not of the fox, to feed on dead bodies. Lam. v. 18 and Neh. iii. 35 are applicable alike to the fox and the jackal, as both are in the habit of burrowing among rocks and ruins; while Ezek. xiii. 4 and Cant. ii. 15 no doubt refer to the proverbial cunning of the fox and its fondness for grapes, though the jackal is equally destructive to vineyards. That foxes and jackals were formerly, as now, common in Palestine, may be inferred from the names derived from these animals, as "Hazar-shual" (Josh. xv. 28) and "Shalim" (I Sam. ix. 4). There is no ascertained reference to the jackal in the rabbinical writings, while the fox is often spoken of. The latter's term of gestation is six months; it prowls among ruins, burrows in the earth, is even found to inhabit a hollow gourd; kills poultry and young lambs and kids, and is noxious to vineyards (Bek. 8a; Mak. 24b; Ned. 81b; Ket. 111b; Ḥul. 53a; B. Ḳ. 92a; Eccl. R. 98a, etc). In proverbial expressions the cunning and treacherous fox is often contrasted with the kingly lion: "Be rather the tail [i.e., the last] among lions than the head of foxes" (Sanh. 37a; Ab. iv. 15). Of one who belied his great reputation it was said: "The lion has become a fox" (B. Ḳ. 117a; comp. also B. M. 84b; Meg. 16b; Ned. 81b; Ab. ii. 15). 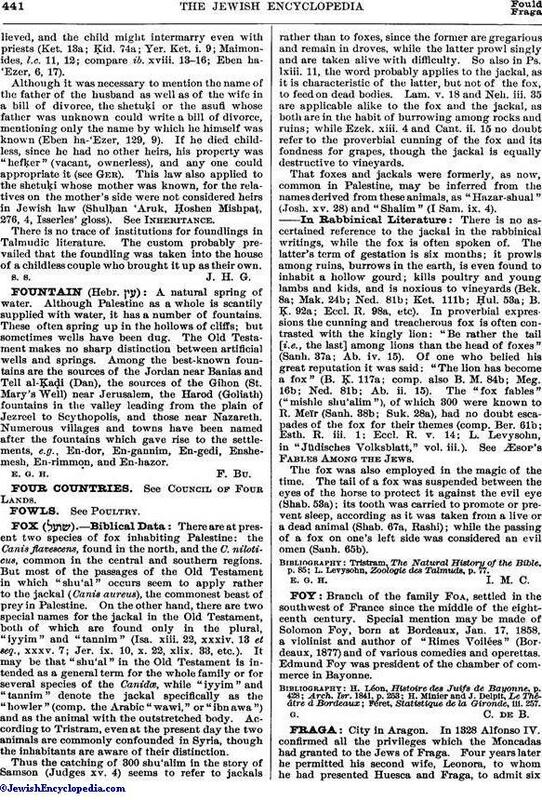 The "fox fables" ("mishle shu'alim"), of which 300 were known to R. Meïr (Sanh. 38b; Suk. 28a), had no doubt escapades of the fox for their themes (comp. Ber. 61b; Esth. R. iii. 1; Eccl. R. v. 14; L. Levysohn, in "Jüdisches Volksblatt," vol. iii.). See æsop's Fables Among the Jews. The fox was also employed in the magic of the time. The tail of a fox was suspended between the eyes of the horse to protect it against the evil eye (Shab. 53a); its tooth was carried to promote or prevent sleep, according as it was taken from a live or a dead animal (Shab. 67a, Rashi); while the passing of a fox on one's left side was considered an evil omen (Sanh. 65b). L. Levysohn, Zoologie des Talmuds, p. 77.